Geophysics is associated with thorough study of the physics of the Earth and its environment in space. It also deals with the Earth using quantitative physical methods. The notion of geophysics ascribes to the geological applications such as Earth's shape, its gravitational and magnetic fields, its internal structure and composition; its dynamics and their surface expression in plate tectonics, the generation of magmas, volcanism and rock formation. Contemporary geophysics organizations describe the geophysics as the hydrological cycle including snow and ice; fluid dynamics of the oceans and the atmosphere; electricity and magnetism in the ionosphere and magnetosphere and solar-terrestrial relations; and analogous problems associated with the Moon and other planets. Geophysical phenomena and society interact in both directions. It has been observed that strong and sudden Geophysical forces greatly affect society. Basically, Geophysical phenomena include earthquakes, Tsunami, Volcanic activity, cyclone, geographical features and their location, changes in critical geographical features (including water bodies and ice-caps) and in flora and fauna and the effects of such changes. Societies sometimes do not manage well its proximity and relation to geophysical risk. At the same time, there is a poor and declining monitoring and forecasting capabilities and inadequate warning systems. In broadly unified world, any single geophysical danger can have appalling consequences far beyond the range of immediate physical effects. In environment, Global geophysical events are naturally occurring observable facts, but these happen in huge intensity. Except within the circumstances of scale and extent, the processes and mechanisms that support them, and their physical effects and consequences, are no dissimilar from the geophysical events whether windstorm, flood, volcanic outbreak, earthquake or tsunami that causes natural disasters every year. Global geophysical events are low frequency high consequence geophysical phenomena which can have harmful implication for the environment and civilization. Global geophysical events have detrimental consequences for the world's environment, market and civilization. These events may occur due to a global physical effect, such as an incident of severe terrestrial cooling in response to a volcanic 'super-eruption' or large comet or asteroid impact, as a consequence of subsidiary outcome for the global market and social fabric of a catastrophic regional event, such as an Atlantic- or Pacific-wide 'mega-tsunami', or a more spatially confined event at a deliberately sensitive location, such as the expected major Tokyo volcanic activity. In current environmental situation around the globe, Geophysical phenomena cause worldwide problems which may have had comparatively minor consequences in the narrow, detached, subsistence societies for centuries. However, observations, records and accounts, some more reasonable than others, do exist in support of disastrous geophysical events occurring in the last several millennia that have capability to disrupt the societal activates. These provide us with some restraint on return periods of those GGEs that are more recurrent. Such as, serious climate-perturbing volcanic eruptions occurred in both 1783 (Grattan et al. 2003) while comparable events occurred at Baitoushan volcano (North Korea–China border) in AD 1030 and at unknown locations in AD 450 and 1259 (Oppenheimer 2003a,b). In our natural environment, various forms of disasters occur in severe intensity. All disasters threaten the humans or societies and had their impact from one decade to another. Earthquake is a vicious tremor, rolling or hasty shock on surface of earth's crust, sending out a sequence of shock waves in all directions from its place of source which is known as epicentre. Earthquake is considered as most dangerous natural disasters causing massive destruction and causality to human life and debilitating impact on societies. Reports signify that an earthquake is caused by the sudden discharge of gradually accumulating strain energy along a fault within the earth's crust. Areas of surface or underground fracturing that can results in earthquakes are known as earthquake fault zones. Environmental reports indicated that approximately fifteen percent of the world's earthquakes happen in Latin America, focused in the western cordillera. An earthquake's power is measured on the Richter scale using an instrument called a 'seismometer'. A seismometer detects the vibrations caused by an earthquake. It plots these vibrations on a seismograph. The strength, or magnitude, of an earthquake is measured using the Richter scale. The Richter scale is numbered 0-10. There are numerous causes that can result in devastating natural disaster such as earthquake. Earthquakes are mainly due to sudden release of energy in rocks. It is well studied that An Earthquake is a sequence of underground shock waves and movements on the earth's surface caused by natural processes within the earth's crust. By appraising the seismograms from many earthquakes, scientists have revealed that three main levels or shells exist within the Earth. Crust is the outmost surface of Earth. The crust is comparatively light and fragile. Most earthquakes occur within the crust. Scientists consider that underneath the lithosphere is a relatively narrow, mobile zone in the mantle called the asthenosphere. Mantle is the area just below the crust. 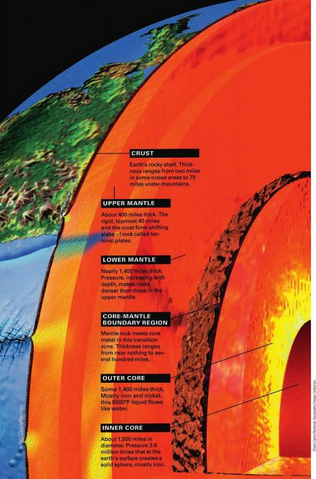 Core is beneath the mantle in Earth. The Earth's core consists of a fluid outer core and a solid inner core. Tectonic plates which are present in the form of rocks move very slowly. It is frequently caused when underground rocks rapidly breaks down or crush and particle against each other along fault line. This lead to the creation of seismic waves or called as earthquake waves, leads to the quivering of earth surface. The points at which earthquake originates called as FOCUS or HYPOCENTRE, point on earth surface above this is called as EPICENTRE. 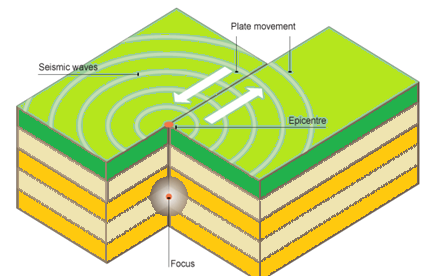 Plate tectonic theory: Huge theoretical framework describes the causes of earthquake, but the most dominant theory is plate tectonics theory which deals with the factors causing earthquake. The outer surface of earth is composed of tectonic plates which are about hundred km thick and are continually moving like an objects sometime moving towards, away from each other. Earth liberates its inner heat by convective mechanism. Hot asthenospheric mantle increases to the surface and extend laterally, transporting oceans and continents as on slow conveyor belt and speed of this movement is very slow. Earthquake explodes only in outer, fragile portions of these plates, where temperature of rocks is very low. Deep in earth centre convections of rocks caused by temperature differences in earth induces stresses that results in movement of overlying plates. This stress from convection discharge enormous amount of heat which stress can collapse the brittle portions of overlying plates. If accumulating stress surpass the strength of rocks comprising these brittles zones, the rocks can break rapidly releasing the stored stretchy energy in the form of an earthquake. There are three types of plate boundaries which are called Spreading, Convergent, or Transform, depending on whether the plates move away from, toward, or laterally past one another respectively. 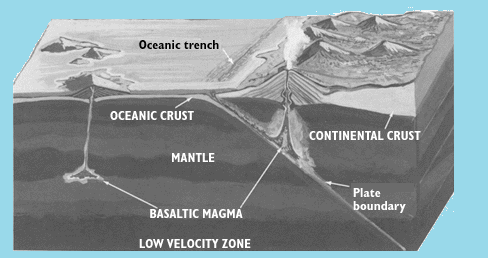 Subduction happens when one plates touches toward another, move beneath it and plunges as much as several hundred kilometres into earth interior. It is said that Earth creates direct hazard to human life. Depending on its size and location, an earthquake can cause the physical phenomena of ground shaking, surface fault burst, and ground breakdown. Several research reports have shown that earthquake hurt economic, population and environmental in very different way such as destruction of buildings, lifeline, triggering fires, releasing of toxins, radioactive and genetically active material and cause other natural disasters such as floods, avalanches, Tsunami, landslides. Earthquakes also have dangerous consequences in socio economic and political arena, disruption of vital services such as supply, medical, law enforcement, drop of production, unemployment, economic deceleration (Robert, 2010). The major danger of earthquake is consequence of ground shaking. Buildings can be damaged by shaking itself or by ground under them settling to a different level than it was before earthquake. It may lead to the ground displacement along fault, which can badly damage that buildings. Flooding may happen due to break of dams or levees along river. Water from river would flood the area, damage the buildings. Surface faulting is the counterbalance or tearing of the ground surface by differential movement along a fault during an earthquake. This effect is usually related with Richter magnitudes of 5.5 or greater and is limited to particularly earthquake-prone areas. Displacements range from a few millimetres to several meters, and the damage usually increases with growing dislocation. Considerable devastation is usually restricted to a narrow zone ranging up to 300 meters wide along the fault, although subsidiary ruptures may occur three to four kilometres from the main fault. 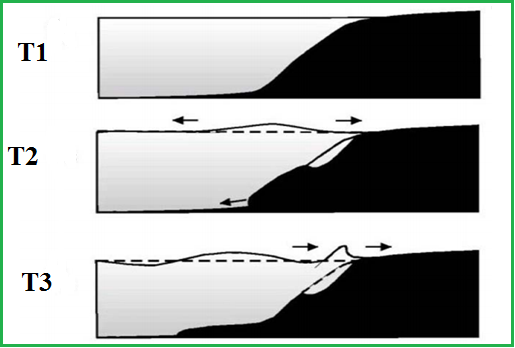 Earthquake-Induced Ground Failure: Landslides occur in various forms. Not only can earthquakes trigger landslides, they can also cause the soil to liquefy in certain areas. These forms of ground failure are potentially disastrous. Earthquake-Induced Landslides: Earthquake-induced landslides happen under different conditions such as in sharply sloping to nearly flat land; in bedrock, unconsolidated sediments, fill, and mine dumps; under dry and very wet conditions. The major criteria to categorise landslides are types of movement and types of material. The types of landslide movement that can occur are falls, slides, spreads, flows, and combinations of these. Materials are grouped as bedrock and engineering soils, with the latter subdivided into debris (mixed particle size) and earth (fine particle size) (Campbell, 1984). Some earthquake-induced landslides can take place only under very wet conditions. Some types of flow failures, grouped as liquefaction phenomena, occur in unconsolidated materials with almost no clay content. Other slide and flow failures are caused by slipping on a wet layer or by interstitial clay serving as a lubricant. 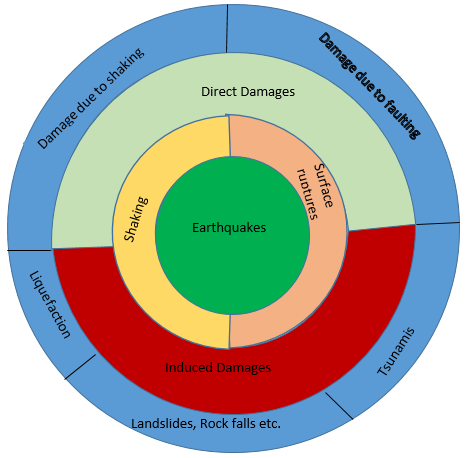 In addition to earthquake shaking, generate mechanisms can include volcanic eruptions, heavy rainstorms, quick snowmelt, rising groundwater, undercutting due to erosion or excavation, human-induced vibrations in the earth, overloading due to construction, and certain chemical phenomena in unconsolidated sediments. Rock avalanches, rock falls, mudflows, and rapid earth flows can cause huge deaths due to earthquake-induced landslides. Rock avalanches begin on over-steepened slopes in weak rocks. They are unusual but can be disastrous when they occur. It was reported that The Huascaran, Peru, avalanche which originated as a rock and ice fall caused by the 1970 earthquake was responsible for the death of approximately 20,000 people. Rock falls happen most commonly in closely jointed or weakly cemented materials on slopes steeper than 40 degrees. While individual rock falls cause comparatively few deaths and limited damage but they are considered as a major earthquake-induced hazard because they are so recurrent. Scientists make great efforts to minimize the natural disaster through prediction. In order to lessen the impact or to avoid the risks from earthquakes, it is necessary to predict their occurrence. While scientists cannot regularly predict earthquakes, but it is appealing area of study and may be major factor in reducing risks in the future. Another way to lessen the impact of disaster is seismic risk assessment, which enables planners to recognize areas at risk of earthquakes and/or their effects. This information is used to tackle the third area of earthquake risk reduction-mitigation measures. Currently scientific studies demonstrate that major earthquakes do not happen again in the same place along faults until sufficient time has elapsed for stress to build up, usually a matter of several decades. In the main seismic regions, these 'quiet' zones present the greatest danger of future earthquakes. According to the seismic gap theory, several gaps that had been recognized near the coasts of Alaska, Mexico, and South America affected by huge earthquakes during the past decade. In some regions, earthquakes occur at the same place, but decades apart, and have nearly indistinguishable characteristics. Monitoring this seismic gap is an important constituent to know about earthquakes, predicting them, and preparing for future ones. According to the seismic gap theory, the U.S. Geological Survey has developed maps of the coast of Chile and parts of Peru for the U.S. Agency for International Development's Office of Foreign Disaster Assistance (USAID/OFDA (Nishenko, 1985). These maps provide possibility estimates and rank earthquake risk for the time period 1986 to 2006. It can be established that Earthquake prediction involves checking several aspects of the earth, including slight shifts in the ground, changes in water levels, and emission of gases from the earth, among other things. A seismic risk assessment is basically the appraisal of potential economic losses, loss of function, loss of confidence, fatalities, and injuries from earthquake hazards. Hazard Prediction Probabilistic ground motion maps outline earthquake ground motions that have a common probability of being exceeded in a certain period of time. They are based on historical earthquake locations and geological information on the reappearance rate of fault ruptures, and assume that the historical trends can be projected into the future. Geomorphology as a guide to fault activity Dip-slip faults (that is normal and thrust faults) are related with vertical motions and create topographic fault scarps. In perfect earth, the most recently active faults would have the highest, steepest fault scarps, allowing prediction of earthquake hazards. Unfortunately, very active, hazardous faults may have no discernible fault scarps if they cut through soft unconsolidated sediments and if they have only recently become active. Strike-slip faults are associated with lateral movement and often have no topographic expression. Instead, lateral oﬀset of rivers or linear geological features can confirm where these faults are. Oblique-slip faults have both lateral oﬀsets and topography. Some major earthquakes are indicated by the occurrence of foreshocks which can be identified by dense local monitoring networks. However, if a small seismic event is recorded, it is very hard to tell whether it is just a single, low-magnitude earthquake or a foreshock to a major, high-magnitude earthquake. Other indicators: In the periods between earthquakes, strain amasses gradually in the general region surrounding a fault as the deep, spongy parts of the plates slip past each other continuously. This inter-earthquake deformation should cause micro-cracks to form, which should modify physical properties of the rocks. In various seismically active parts of the world, electrical and magnetic properties and changes in seismic speed are continually monitored to better understand the inter-earthquake deformation process. Such monitoring systems cannot yet forecast earthquakes but it is anticipated that it will work in future. The knowledge of seismic phenomena is very little to modify the hazard by controlling tectonic processes, but there are many ways to control the risk or exposure to seismic hazards. There are four steps involved in conducting a seismic risk assessment. An evaluation of earthquake hazards and prepare hazard zonation maps; an inventory of elements at risk, for example structures and population; and a vulnerability assessment; and determination of levels of acceptable risk. Evaluating Earthquake Hazards and Hazard Zonation Maps: In an earthquake-prone zone, information will certainly exist on past earthquakes and associated seismic hazards. This can be added with existing geologic and geophysical information and field observation. Depending on geologic circumstances, some combination of ground shaking, surface faulting, landslides, liquefaction, and flooding may be the most severe potential earthquake-related hazards in an area. Maps must be drawn to demonstrate zones of these hazards according to their comparative severity. These maps give the schemer with data on such considerations as the spatial application of building codes and the need for local landslide and flood safeguard. Assessing Ground Shaking Potential: Albeit ground shaking may cause devastating earthquake, it is one of the most difficult seismic hazards to forecast and quantify. This is due to the intensification of the shaking effects by the unconsolidated material overlying the bedrock at a location and to the differential resistance of structures. Subsequently, best way to communicate ground shaking is in terms of the probable response of particular types of buildings. These are grouped according to whether they are wood frame, single-story masonry, low-rise, moderate-rise, or high-rise. Different approaches can be used for planning purposes to foresee where ground shaking would be most stern. The groundwork of intensity maps based on devastation from past earthquakes rated according to the tailored Mercalli Index, the use of a design earthquake to compute intensity and in the absence of data for such approaches, the use of information on the causal fault, distance from the fault, and depth of soil overlying bedrock to estimate possible destruction. Assessing Surface Faulting Potential: This is comparatively easy to perform because surface faulting is linked with fault zones. Three factors are vital to assess appropriate mitigation measures that include probability and extent of movement during a given time period, the type of movement (normal, reverse, or slip faulting), and the distance from the fault trace in which damage is expected to take place. Assessing Ground Failure Potential: This process is appropriate for earthquake-induced landslides. Liquefaction potential is determined in four steps that include a map of recent sediments is prepared, distinguishing areas that are probable to be subject to liquefaction from those that are unlikely; a map representing depth to groundwater is prepared; these two maps are combined to produce a liquefaction susceptibility map and a "liquefaction opportunity" is prepared by combining the vulnerability map with seismic data to demonstrate the allocation of probability that liquefaction will take place in a given time period. Natural disaster cannot be controlled but planners can develop indicators to get warning of such disturbing geophysical events. There are numerous of mechanisms that can be used as safety measure to lessen the impact of such hazards such as land-use zoning; engineering approaches such as building codes, support of existing structures, stabilizing unbalanced ground, redevelopment; the establishment of warning systems and the distribution of losses. In earthquake prone areas, buildings can be resistant and builder can make such designs that prevent likelihood of crumple during an earthquake. The inhabitants can be knowledgeable to get ready in event of earthquake and rescue plans can be drawn up in advance to reduce the turmoil when earthquake occur. Relating general ground shaking potential to allowable density of building habitation. Relating building design and construction standards to the degree of ground shaking risk. Implementing rules that require geologic and seismic place examination before development proposals can be accepted. In developed area, adopting a hazardous building abatement ordinance and an ordinance to require removal of dangerous parapets. Restricting permitted uses to those compatible with the hazard, that is open space and recreation areas, freeways, parking lots, cemeteries, solid-waste disposal sites. Establishing an easement that requires a hindrance distance from active fault traces. Prohibiting all uses except utility or transportation facilities in areas of tremendously high hazard, and setting tight design and construction standards for utility systems navigating active fault zones. Ground Failure Mitigation Measures: Land-use safety procedures to lessen possible destructions due to landslides or liquefaction are analogous to those taken for other geologic hazards. Land uses can be limited. Geologic investigations must be done before development is allowed, and grading and foundation design can be synchronized. Stability categories can be established and land uses proportionate with these categories can be recommended or ordained. Land-use zoning may not be suitable in some areas because of the potential for substantial difference within each mapped unit. General Land-Use Measures: In developed areas who are prone to earthquake hazards, measures can be accepted to recognize dangerous structures and order their removal, starting with those that imperil the greatest number of lives. Tax incentives can be established for the elimination of hazardous buildings, and urban regeneration policies should restrict reconstruction in unsafe areas after earthquake demolition. In brief, it can be said that earthquakes are most dangerous and destructive natural phenomenon because every year huge amount of people rendered homeless, displaced, injured or dead. Growing population and global urbanization is increasing the threat to earthquake. 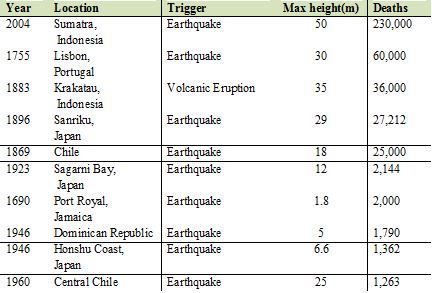 Spiral distribution of earthquake shows that some regions are more prone to this natural disaster than others. The Indian sub-continent is very prone to several natural disasters such as earthquakes which is destructive natural hazards with the potentiality of causing huge loss to human lives and assets. Earthquakes pose major threat to India. It is estimated that 59% of its geographical area is vulnerable to seismic disturbance of varying intensities including the capital city of the nation. Almost the entire Northeast region, Northern Bihar, Himachal Pradesh, Jammu & Kashmir and some parts of Kutch are in seismic zone V, while the whole Gangetic plain and some parts of Rajasthan are in seismic zone IV. Tsunami is devastating natural disaster and immensely affects the economic and living conditions of region where it hits. Tsunami is a Japanese phrase which means tsu means harbour and nami means wave. This geophysical phenomenon is associated with earthquake or volcanic eruption or landslides or adjacent to oceans and results in unexpected movement of water column (Bryant, 2008). The channel of tsunami involves the movement of water from surface to seafloor which indicates it is directly linked to depth of water bodies that is deeper the ocean, higher is the movement of water. Consequently, as wave approaches land and reaches increasingly shallow water, it gets slow down. However, the water column still in deeper water is moving slightly faster and catches upward, resulting into wave gathering up and becoming much higher. Tsunami is a succession of waves and first may not necessarily be biggest. Tsunami is a cruel turbulence deep below the ocean surface that results due to under water earthquake and subduction zones (Irasema Alcántara-Ayal, 2010). Accounts for Tsunami extend back almost 4000 years in China, 2000 years in Mediterranean where the first Tsunami was described in 479 BC and about 1300 years in Japan. Mediterranean Sea is one of the longest records of Tsunami. The Caribbean is also prone tsunami. The major cause of Tsunami is seismic activity. Over the past two millennia, earthquakes have produced approximately, 83% of all Tsunami in pacific oceans (Edward Bryant, 2014). When an oceanic plates strikes the continental plate, these plates press together and build the pressure. Finally the heavier oceanic plate slips under the lighter continental plate and causes earthquake which elevates the level of ocean and drops other parts down, this event on ocean floor is reflected on surface of water above. The gravity acts fast to even out of water surface. The seismic energy generated that giant wave and it does not just disappear. Tsunami extends thousands of feet deep into ocean which carries lot of water and energy so they can travel very far. 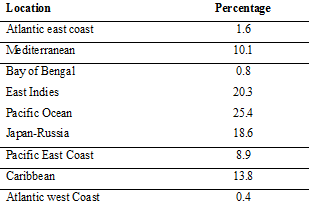 Most trans-oceanic tsunamis are produced by major (Mw≥9.0) earthquakes. These happen several times a century and recently happened in countries like 1960 (Chile), 1964 (Alaska) and 2004 (Sumatra). The Chile event generated tsunamis that were 3–4 m high when they struck Japan, while run-up heights of 4 m were also recorded on the East African coast following the December 2004 Sumatra earthquake. 'Mega-tsunami', is basically a media-driven descriptor. These waves are in excess of 100 m in height at source, and which remain destructive at oceanic distances. The great (Mw∼9) Cascadia (western North America) earthquake of 1700 generated Pacific-wide tsunamis, but these appear to have been of the order of 3 m high at shore in Japan (Satake et al. 1996). Tsunamis related with massive collapses at oceanic-island volcanoes can, however, have run-up heights at least an order of magnitude greater. Giant waves caused by ancient collapses in the Hawaiian Islands may have been of Pacific-wide extent. Young & Bryant (1992) stated signs of catastrophic wave erosion up to 15 m above current sea level along the New South Wales coast of Australia, 14 000 km distant, in terms of impact by tsunamis associated with a major collapse in the Hawaiian archipelago around 1.05×105 years BP. These phenomena have been appraised as a tsunami generated by a marine impact. Putative giant-tsunami deposits have been observed at increasing numbers of locations. A landslide generated Tsunami has local temperament, in case of huge landslide, that involve the bottom sediments of continental shelf or at the fall of marine glacier, the Tsunami source may reach the size of several kilometres. These waves have huge heights and attacks aggressively to coastal populace. Landslide motion process is caused by long-term accumulation of segments at some ocean bottom areas, submarine slants of basins into the river deltas. These accumulation segments are subjected to streams, storms, wind waves, tides, hurricanes, tectonic process and after this, landslide body comes into non-equilibrium. In this situation, any weak perturbation action has vital role for failure of unstable slide body. When the landslide moves at a speed equal to the velocity of the long gravity wave in the basin, the harmonization happens. This particular conditions cause a resonance for transmission of energy from the landslide to the surface of water wave and height of the wave crest increases accordingly. Destruction of Tsunami results from inundation by salt water, impact dynamism and erosion. Considerable damage is also caused by flooding debris that enhances the destructive force of flooding. Flotation and drag force can destroy frame buildings, overturn railroad cars and move large ship far inland. 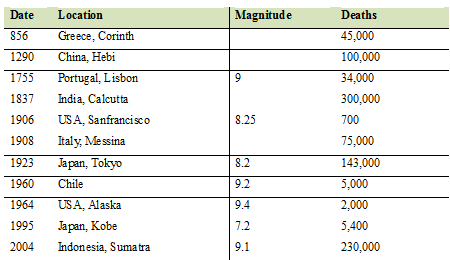 Average height of Tsunami caused by earthquake with magnitude of 7.5- 8.00 is between 3 and 10 m along 100- 300 Km to the coastline closest to the epicentre (Tom Beer, 2010). Hazards of tsunami: Tsunami is highly disturbing natural disaster that cause huge amount of the loss of humans and infrastructure. The risk potential of tsunamis is main interest for scientists. The Asian tsunami caused approximately 250 000 deaths, huge economic losses and long-term harm to development programmes in the affected countries, brought home to the world the realities of the hazard. The Asian tsunami was a really global disaster which affected in many countries in the region as well as tourists from the industrial world in Southeast Asia. The probable consequences of severe events consist of global economic crises, many millions of deaths, calamitous and irrecoverable destruction of super cities and possibly whole countries, global disturbance of food supplies, transport and communications, severe climate states and environmental pollution on a global scale. These effects may results in food shortage, disease, political trouble, disintegrate social order, failure of international and national organizations and perhaps the occurrence of wars and fall down of development. It is important that scientists must explore the ways to reduce the hazards of Tsunami which strike many shorelines. Numerous nations monitor the generation and movement of Tsunamis. The seismic sea wave warning system was established and became operational after the major Tsunami strike in 1946 in Hilo, Hawaii and parts of Japan and other coastline around the pacific. This system generally operate by monitoring seismograms to detect potentially seismogenic earthquake, then monitor tide gauges to determine if a Tsunami has been generated. To summarize, Tsunami natural disaster has 5th ranking among devastating natural events in the world in terms of huge loss of life. Tsunami is a series of long water waves, propagating with high speed from source in the Ocean to coastline. When these waves encounter shallow water, they may form huge breaking waves with walls of water tens of 100 feet tall that slam ashore. Every few years these waves rise suddenly out of the ocean and sweep over coastal communities results in huge causalities and massive destruction. Triggering mechanisms for Tsunamis include earthquake related displacements of sea floor, submarine slumps and landslides that displace sea water, submarine volcanism, explosive release of methane gas from deep ocean sediments and asteroid impacts. A volcano is type of vent or smokestack which transmits molten rocks called as Magma from depth to earth surface. Magma outbreak from volcano recognized as lava, it is a material which builds up the cone. Volcanoes are mountains built by the accumulation of their own eruptive products such as lava, bombs. The explosive nature of volcano eruptions depend on flow of magma and amount gas trapped within magma. Huge amount of water and carbon dioxides are dissolved in magma. As magma quickly rises through earth crust gas bubbles form and expands up to 1000 times of their original size. In the twentieth century, volcanic explosions have dangerous impact on substantial economic and societal arena. Perilous volcanic activity will continue to occur in countries like U.S., and, because of increase in populations, development pressures, and expanding national and international air traffic over volcanic regions, there is a great risk of life and property through exposure to volcano hazards. In volcano eruption, heat concentrated in the Earth's upper mantle raises temperatures adequately to melt the rock locally by fusing the materials with the lowest melting temperatures that results in small, isolated blobs of magma. After that, these blobs collect, rise through conduits and fractures, and some ultimately may re-collect in larger pockets or reservoirs a few miles under the Earth's surface. Increasing pressure within the basin may drive the magma further growing through structurally weak zones to explode as lava at the surface. In a continental environment, magmas are generated in the Earth's crust as well as at varying depths in the upper mantle. The variety of molten rocks in the crust, plus the possibility of mixing with molten materials from the underlying mantle, leads to the creation of magmas with broadly different chemical compositions. The form of volcano is determined by types and sizes of its explosions which is controlled by characteristics and composition of magma. Volcanic incidents influence the world's ambience far more recurrently than asteroid or comet impacts. In particular, major volatile eruptions are capable of altering the Earth's climate through the discharge of large quantities of sulphur gases capable of mixing with atmospheric water to form stratospheric aerosol clouds. The level of solar radiation reaching the troposphere and the Earth's surface is considerably reduced by volcanic aerosol clouds. In the last century, two eruptions, at El Chichon (Mexico) in 1982 and Pinatubo (Philippines) in 1991, have had a considerable cooling effect around the globe. Reviewing the historical events, eruptions at Laki (Iceland) in 1783 and Tambora (Indonesia) in 1815 had major, damaging impacts on the regional and global climate. The Tambora outbreak was the biggest identified historic eruption (Oppenheimer 2003a). Though, this may be regarded as a minor volcanic event in comparison with the 7.35×104 years BP 'super-eruption' of Toba (Chesner et al. 1991). The Hazard of volcano eruptive events are Pyroclastic explosions, Hot ash releases, Lava flows, Gas emissions, Glowing avalanches (gas and ash releases). Secondary events include melting ice, snow and rain accompanying eruptions are likely to provoke floods and hot mudflows (or lahars), hot ash releases can start fires. The earth crust is their thinnest layer which is broken down into various pieces termed as plates. These plates are above the hot liquid magma. Each plate consists of some continental crust and some oceanic crust. Huge currents of molten rocks move deep in mantle and cause plates to move about very slowly on earth surface. Many of world volcano happen along boundaries of boundaries of plates. Plate boundaries are among most active geologically active place on earth. Here new rocks have been formed and destroyed. In these areas, most important volcanic activity occurs. Volcanoes have perilous impact on the species of earth. 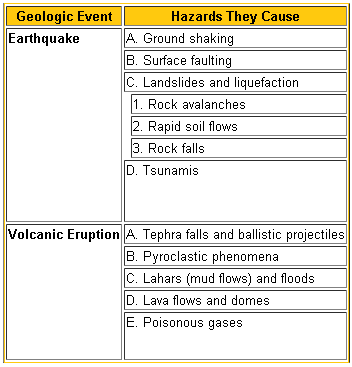 Major hazards includes explosions, lava flows, bombs, mudflows, landslides, earthquakes, ground deformation, tsunami, air shocks, lightning, poisonous gas, glacial outbreak flooding. Each volcanic eruption has dissimilar outcomes. Volcano Hazards Program (VHP) under the Disaster Relief Act (P.L. 93-288) is to augment public protection and lessen losses from disastrous volcanic events through effectual forecasts and warnings of volcanic hazards based on the best possible scientific information. The Volcano Hazards Program conducts four major science activities to decrease volcanic jeopardy in the Nation that include monitoring volcano unrest and eruption, preparing volcano hazard assessments, conducting research on volcanic processes, and providing reliable forecasts, warnings, and volcano-hazard information. Measurement of volcano: Volcano event is measured through simple descriptive index called as volcano explosively index which ranges from zero to eight. 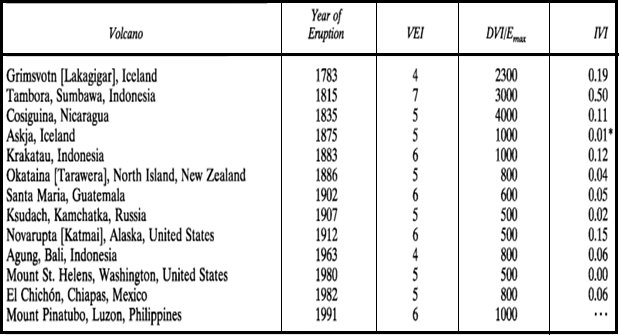 This index includes volume of material ejected with height of an eruption column and duration of eruptions. To summarize, Volcanic explosion can flash storms of lightning that are as strong as the biggest super storms. Fundamentally, a volcano is a landform formed by magma from the earth's interior which penetrates through weaknesses in the Earth's surface. Most volcanoes are created at plate boundaries. Volcanic eruptions produce hazardous conditions, which sternly affect people and human infrastructure, near the volcano, in downstream valleys, and thousands of miles away. A Cyclone is described as geophysical phenomenon on the surface of planet and atmospheric system of low barometric pressure accompanied by strong winds that revolve counter-clockwise in northern hemisphere and clockwise direction in southern hemisphere. The phrase "Cyclone" is originated from the Greek, word "Cyclos" which means the coils of a snake. Henri Peddington stated that the tropical storms in the Bay of Bengal and in the Arabian Sea appeared like the coiled serpents of the sea and he named these storms as "Cyclones". It is also identified as hurricanes in western Atlantic and Eastern Pacific, typhoons in western Pacific, cyclone in Indian Ocean and Southern Pacific Ocean. Wind speed of cyclone can exceed 90m/s, rainfall rate approach 100mm/hr, and ocean waves are churned up to 35m. At land fall death and destruction spread across wide areas without respect for geopolitical boundaries. Coastal buildings are flooded by ocean surge, inland water waves overflow their banks and claim homes and businesses, tornadoes chart narrow but unpredictable path in outer bands and eyewall and both coastal and inland structures are damaged after prolong mauling by wind and wind driven projectiles (Barrett, 2007). It has been documented in environmental studies that Cyclones have considerably affected populations in Southeast Asia, the Western Pacific, and the Americas since last century. In future, susceptibility to cyclones will augment due to population growth, urbanization, increasing coastal settlement, and global warming. Major source of energy for humid cyclones is the warm ocean in tropical regions. To instigate a tropical cyclone the sea surface temperature must be around 26C or above. However, existing cyclones often persist as they move over cooler water. The expansion of tropical cyclones also realises on positive broad scale regions and can continue for several days with many following quite erratic paths. They lose their source of energy when they move over land surface or colder oceans causing them to disperse. Deteriorating may also occur if cyclone moves into an adverse wind regions which disturb the structure of wind system. Sometimes a decomposing tropical cyclone may interact with weather system in higher latitudes to cause impact far from tropics. Cyclone can form only in warm ocean waters near equator. To form a cyclone, warm, moist air over ocean rises upward from near the surface. As this air moves up and away from ocean surface, it leaves it less air near the surface. Air from adjacent region with higher air pressure shoves into low pressure area, then this new cool air become warm and moist and increases to give birth to cyclones. As warmed moist air rises and cool the water in air forms clouds. The whole system of clouds and winds rotates and move, fed by ocean heat and water dispersed from ocean surface. As storm system spins faster and faster, an eye form in centre, which is cool and clear with very low pressure. Higher pressure air from above flows down into the eye. Tropical cyclones can unfavourably affect, and sometimes positively impact on society and environment. The most widespread impact is heavy rainfall and strong winds that can cause flooding. In some parts of world, Australia tornados have been reported during cyclones. Storm flow or coastal flood by sea water, is also seen during cyclones. Cyclones are linked with high-pressure gradients and resulting strong winds. These, consecutively, produce storm surges. A storm flow is an unusual rise of sea level near the coast caused by a severe tropical cyclone; as a result, sea water floods low lying areas of coastal regions drowning human beings and livestock, corroding beaches and banks, destroying plant life and dropping soil fertility. Very strong winds may damage installations, dwellings, communication systems, trees resulting in loss of life and possessions. Heavy and long-lasting rains due to cyclones may cause river floods and submergence of low lying areas by rain causing huge loss of life and assets. Floods and coastal inundation due to storm surges contaminate drinking water sources that results in outburst of diseases. Keep observing weather and listen to radio, TV, newspapers. Get to know nearest cyclone protection or secured house and safest route to reach their. Check the roof and cover it with net or bamboo. Thoroughly check the walls, pillars doors and windows to see if they are secure. In India, the Government have made stronger the Meteorological Department, through offering Cyclone Surveillance Radars at Calcutta, Paradeep, Visakhapatnam, Machilipatnam, Madras and Karaikal in the east coast and at Cochin, Goa, Bombay and Bhuj in the west coast to cyclone forecast and advance warning. For safety of Indian population, Satellite picture receiving equipment's at Delhi, Bombay, Pune, Madras, Visakhapatnam, Calcutta and Guwahati are receive satellite pictures of the cyclones from the polar-orbiting Satellites of the U.S.A. and U.S.S.R. 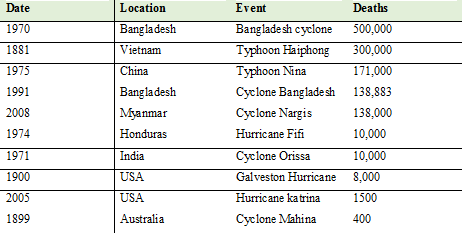 Disaster Prevention and Preparedness for cyclone: At National level, The Government of India recommended in 1969, to the governments of the maritime states to establish "Cyclone Distress Mitigation Committee" in the own states to prevent human loss and reduce damage to properties. CDMC planed the communication systems in the state for fast distribution of Meteorological warnings and prevention measures. Prevention process include development of storm shelters, connecting roads for migration of people, construction of wind breaks, dykes, bunds, flood storage reservoirs, afforestation along the coastal belts and development of drainage facilities. An advance warning will not be successful unless the public is progressive about the critical features and the actions to be taken by them to avoid affliction. At International level, The World Meteorological Organisation has established in 1972, a Tropical Cyclone Project with the aim to help the member countries to boost their capabilities to identify and predict the approach and landfall of the tropical cyclones, appraise and forecast, the storm surges, forecast the flooding arising from the cyclones and to develop system to organise and implement disaster prevention and preparedness measures. One of the effective plans that is in operation to help the countries adjoining the Bay of Bengal and the Arabian Sea is the panel on the tropical cyclones of World Meteorological Organisation and the Economic and Social Council for Asia and Pacific. The WMO/ESCAP panel has a technical support unit. In contemporary global environment, there is revolutionary change due to advent of technology. But most geologic events cannot be prohibited or even predict with accuracy. Landslides are an exception. They can often be prevented. Areas prone to such events can be recognized as earthquake fault zones, active volcanoes, and coastal areas susceptible to tsunamis. However, not all earthquake faults have been identified. Estimates of an incidence of a given hazardous event are probabilistic, based on consideration of the magnitude of an event and its occurrence in time and space. Nevertheless, appropriate alleviation measures can extremely reduce the damage caused by geologic cyclone hazards. To summarize, Geologic hazards like cyclone are accountable for huge human and asset loss of life and annihilation of property. In the twentieth century, more than a million causalities occurred due to natural disaster. 'Cyclone' is globally used to cover tropical weather systems in which winds equal or surpass 'gale force' (minimum of 34 knot, i.e., 62 kmph). These are strong low pressure areas of the earth atmosphere coupled system and are extreme weather events of the tropics. Enormous studies have shown that Tropical cyclones are characterised by destructive winds, storm surges and heavy rainfall which adversely impact on human and farm animals, and their activities.